Mr. James Allen, with the help of Larry Childs, has completed a monumental task. 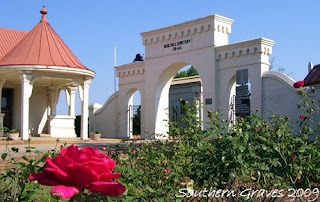 Over 9,700 photos from Rose Hill Cemetery in Macon, Bibb County, Georgia are now online. I know from experience the amount of time and energy that requires, and I personally thank these gentlemen for the effort. Researchers will be forever grateful for their hard work. See it here in the USGenWeb Archives.